On Her Majesty’s Secret Service doesn’t really fit with the rest of the Bond films. It feels like someone created a fake Bond film or even in some cases a spoof. Some of the key ingredients are there but everything feels off and if you add that to the bizarre story and the way in which events play out, it makes for one of the strangest films in the franchise. First of all, George Lazenby doesn’t feel like James Bond. He isn’t terrible. He can hold his own in the action scenes, looks handy with a gun and manages to pull of looking good in a tuxedo but doesn’t really feel like the British super spy. It is difficult because Sean Connery had made the role his own with 5 films, of varying quality but one constant, a very good James Bond. Lazenby definitely isn’t doing an impression of Connery but also feels too far removed to ever really be the same character. The same goes for the story as well. The previous Bond films had been extravagant action stories, punctured with impressive action sequences (particularly for the time they were filmed). The finale’s were often impressive too, particularly in the Bond film that preceded this one – You Only Live Twice. It would perhaps be better if the villain of the story, and one of the most iconic of the whole franchise, Ernst Blofeld, didn’t seem to be a different character entirely in this version. The iconic look of the villain, made famous by Donald Pleasance, with the scar and the cat, completely disappears and we get the younger, taller and much less menacing Telly Savalas. This is without explanation or any confusion on the part of Bond. It is brushed away as if not important. The same can be said for the central love story in the film. This is the movie where Bond falls in love and actually gets married but doesn’t really work when his bride-to-be is sidelined for most of the film until it becomes convenient to have her included. It is then the quickest and most implausible “falling in love” you’ll ever see and again, isn’t like the Bond we have seen in the five previous instalments. The fact that Sean Connery returns after this blip helps bury this as the franchise’s worst so far. There are some small positives, from the great soundtrack by Louis Armstrong to some of the skiing action scenes. Unfortunately, these are over-shadowed by the bizarre choices that make up the rest of this entry into the Bond franchise. 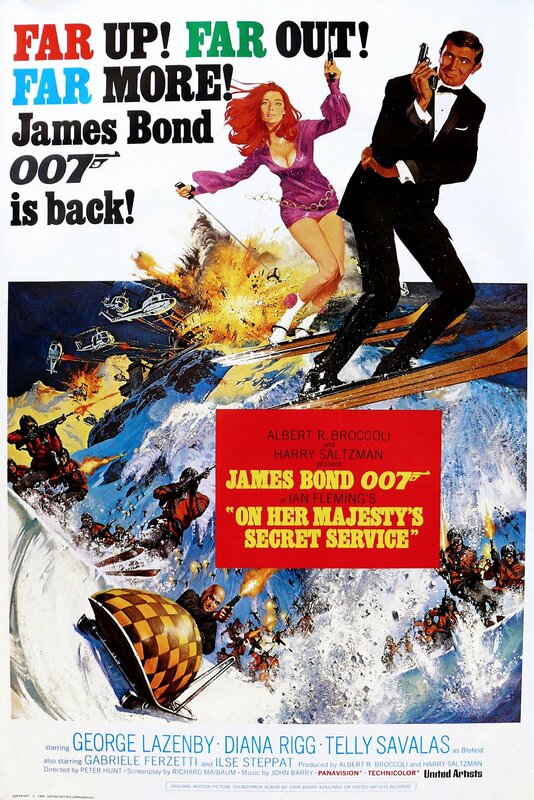 Overall, On Her Majesty’s Secret Service is the odd-one-out in the Bond franchise and rightfully so. George Lazenby is a bizarre choice, followed by the lack of action, a slow plodding story, a waste of a great villain and the worst love story in the franchise history. There is a clear reason why Connery was asked to return.